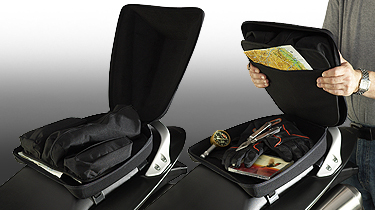 Standard bikes, naked bikes, and sport bikes offer little in the way of carry-along storage space, so we developed the roomy 4-liter Storage Pod to give you a stylish and practical way to carry the essentials. The Pod offers a spacious interior without a lot of external bulk, and the streamlined shape integrates well with the tail of your bike. Once you put one on your bike, you may never take it off! National Cycle's extremely versatile, 4-liter rear Storage Pod is a great addition or alternative to the standard tank bag for standard bike, naked bike or sport bike riders. In addition to the Pod's main compartment, four zippered storage compartments (three main compartments and one document holder) are attached to a cleverly designed removable tray. Stuff them all and fill the top cavity of the Pod, or remove the tray altogether to open the space into one very large main storage area. 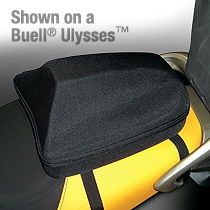 The Velcro® hinge makes removal of the tray a snap. The Storage Pod's sturdy double zippers keep everything secured inside while the adjustable web straps and coated hooks attach it to the bike. 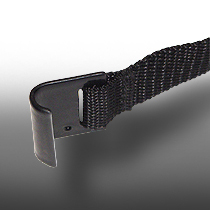 We include plenty of length in the web straps to make mounting the bag – under the seat, to the rear tail cowling, or through a rack – an easy process. The thermo-molded pod has a soft inner shell and is covered with a durable, water-resistant black canvas hide. 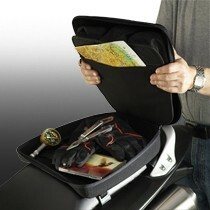 Sturdy double zippers keep contents secure.